TurboTax 2014 Review – Still The Tax King? Turbo Tax is the most popular tax prep software there is among do-it-yourself tax filers. The makers of this package boldly claim (and guarantee) that if you use their software, your taxes will be done right, 100% of your calculations will be accurate and you’ll get the maximum refund possible – even if you have no previous tax knowledge. Those are some pretty bold claims Pilgrim. Do they really come up with the goods? I’m pretty demanding when it comes to accounting software. I’m not a CPA but my degree is in accounting and I’ve working with clients and their tax returns for over 28 years. I know what to look for. Is it the best tax prep software package available? When you start using the program, the first thing the software asks is a number of very simple questions. You could easily complete this part of the tax return during commercial breaks while you watch Law and Order re-runs on TV. Have you bought or sold a house? Do you have any new dependents? Because they ask in a conversational tone, it engaged me and encouraged me to continue. I like that. In both cases, the questions are structured to find tax deductions and tax credits. And as you answer, you get instant positive reinforcement. The moment it determines that you qualify for certain tax breaks TurboTax gives flashes the good news up on the screen. That’s fun. It also saves you a ton of time and money. The software is constantly updated with changes to the laws regarding tax deductions, tax credits, how to deal with student loans, charitable donations, child care credits, etc. They are even up to speed on health care law. That is a lot more than most CPAs I know. First you tell the program about your personal situation and then you input data on your business income and expenses if appropriate. You go on to input data on your personal income, your deductions and credits and any other special situations like AMT, penalties, retirement distributions etc. The beauty is you don’t have to know a thing about these areas or tax in general. The program asks you very simple questions and makes is super easy. If you do get stuck at any time, you can plug in to their support. Redemption. 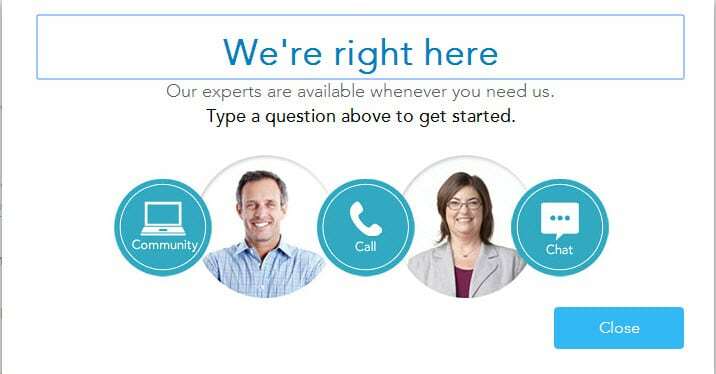 You can either go to their forums, call a live human Tax Turbo expert or go to live chat. If you do opt for speaking to one of their tax experts, you can call 7 days a week from 5 AM to 9 PM Pacific Time. Outstanding Winston! Once you’ve completed the input section, you go to the Federal review section and the program gives your return the once-over. TurboTax then looks to see if you’ve missed some data or made an error. If everything is copacetic, the program goes on to get information from you to compile your State return. It reviews that as well and then files both your returns. Simple. Cheap. Clean. Cool. At any time during the process you can sign out and save your work. And before you leave, the program gives you a cute screen to set a reminder in your calendar to come back and finish up. That same screen also gives you another opportunity to get live help or live chat. That’s going the extra mile if you ask me. After you file your returns, the service doesn’t stop. They send you an email to notify you when the IRS acknowledges receipt for your return. TurboTax can import some W-2’s and 1099’s but only from participating financial institutions and employers. It can also import data from a variety of other tax prep programs like Mint and It’s Deductible. On top of that, you can import previous years’ data from other programs such as H &R Block At Home and TaxACT. That means if you decide to switch to TurboTax from one of these other vendors, it will be an easy move. TurboTax offers solutions for personal and business applications. They offer online software or CD’s and downloads. They have free editions, deluxe, premier and home & business. That is a lot to choose from. Which is right for you? With respect to the CD/downloads vs online version it’s simply a matter of personal preference. If you opt for the CD/downloadable version the software checks for updates every time you open it so you don’t need to be concerned about the program being out of date. If you use the online version it’s obviously constantly and automatically updated. Also, you don’t pay until you file. That’s cool. As you’ll see, you also save yourself some nice cabbage if you go the online route. The only downside of course is that it is all done online. I am OK with doing this on the net but I can see why others might not be. The egg heads in the white coats at TurboTax really used their brain genius when it comes to this. All you have to do is select “Products & Pricing”. They have a nifty little tool to help you decide which is the best version for your particular needs. All you have to do is check the boxes (red arrows above) to describe your unique situation and voila! The friendly little program tells you which product is most suitable for you. By the way, if you go with the online version, it’s easy to upgrade in mid-stream if you find the need. That’s cool. When you use TurboTax you’ll need a lot less help than you might otherwise think. That’s because the questions are so clearly stated and conversational. That’s not to say you won’t run into a brick wall from time to time. After all, we are talking about the IRS. ? As I suggested above, you’ll get plenty of help when you need it. In addition to the live support, live chat and forums, they have more tax tip videos than Netflix. (I’m not sure that Netflix has any tax tip videos but whatever…..) You can find video instructions on how to stay clear of IRS audits, how to set up IRS payment plans, tips for newlyweds, who you can claim as a dependent and much more. Their video list was 3 pages long for crying out loud! Their free calculators estimate your tax refund, help you determine your W-4 withholding, determine if you qualify for health care tax subsidy, ,how life events impact your tax situation and so on. I loved the way TurboTax took me by the hand and lead me through the entire process. I didn’t have to waste any precious brain power trying to interpret what they wanted me to do. But I didn’t lose control of the process either. Many of the sections allowed me to jump off the beaten path and skip right over to what I wanted to do. For example, under “Personal” there is a section on Income and another on Deductions. In both areas, I could either choose what I wanted to work on and go right there or let the program walk me through the process each step of the way. I like that freedom. I felt respected. 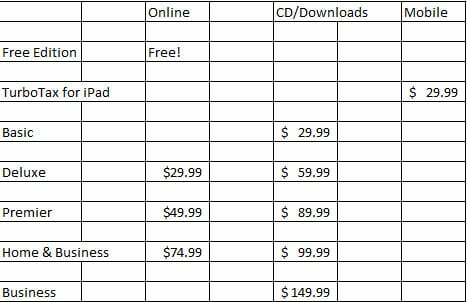 Below is a chart that compares the different prices. If you are a consumer, you are looking at spending between nothing to $99.99. If you run a small business corporation, partnership or trust, the damage is $149.99. 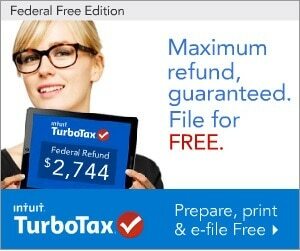 Each of the TurboTax packages (including the free version) includes free Federal e-filing. If you want to use the product to e-file your State taxes (of course you should) that will set you back $36.99 per state. The free version is a web-based application. The Fed filing is included and the State filing is $27.99. It has some helpful guidance for basic situations. But it’s not really geared for you if you have self-employment income, capital gains, rental property or farm income. TurboTax understands that service men and women have special tax needs and they have a few nice options for you at reduced prices. That is nice and considerate. Sempre Fi! I scoured the internet and read as many user reviews as I could. I read one gripe about IRA contributions. The program alerted the user that the IRA contribution he was about to make was non-deductible. That was fine. But the program didn’t provide retirement plan alternatives. I don’t think that’s a particularly fair complaint. I personally think that this is asking too much but there you go. After I went through the program from top to bottom I only had one other problem. They advertise that they “guarantee” you will get the highest refund and that’s somewhat misleading. What they mean by that is if you get a larger refund or smaller tax due from another tax prep method, they’ll refund the price you paid for the product. Also, you have to make your claim within 60 days of your TurboTax filing date. To me, that’s sneaky because it leaves the onus on the user to do a lot of checking. This is just a smooth marketing ploy. The TurboTax guys didn’t need to do that and frankly I think it’s beneath them. Sorry. That’s how I feel. On the brighter side, if these are the only two bumps in the road, that’s impressive. And as I said, I was super impressed indeed. First and foremost, I love how intuitive and easy the program is to use. If you play around with the software, I am sure you’ll come away with the same conclusion. The help options are world-class. You can get tax guidance from human experts, live chat, forums, videos and calculators. These resources are available on every screen so you’ll never feel alone. I like that the process is seamless and they walk user through each step. The fact that you can transfer data from other tax prep programs makes it very easy as well. Users who reported using that feature reported that the process took less than 2 minutes and it had enough checks and balances to insure the data was imported correctly. At the start of this review, I said that we would evaluate TurboTax from three angles. Is it easy to use , is it accurate, is it the best? Ease – Yes. I went through the process and it was not only easy – it was kind of fun. No problem there. Accuracy – In my examination of user comments, I didn’t see any complaints about the program being flawed or inaccurate. Whenever you talk about human beings you are going to encounter mistakes. That’s unavoidable. But when it happens it is usually the result of “operator error”. I am not worried about the program being reliable. Best – I am going to review other tax preparation software packages soon. But Intuit (the owner of TurboTax) has had years to perfect the program. There are over 60 million Americans who file their own taxes. 59.8% of those people used TurboTax to complete and file their returns. The nearest competitors (H &R Block and TaxACT each have less than a third of that market share. That’s a lot of votes for TurboTax if you ask me. Does that mean they are the best? I am not sure. But it says something important. Given the number of years TurboTax has been around and the dominant market share they control you’d have to take a very serious look at this package if you are a DIY tax filer. The program is extremely well suited for the person just starting to do their own taxes which more and more people are doing. TurboTax will gently walk you down and relieve you of the stress that you may normally associate with doing your taxes. Other programs could be a little more or less expensive but we aren’t talking about a lot of money either way. When we consider all the time you might have to invest in preparing your taxes and how important it is to complete your return accurately, it’s a no-brainer. TurboTax is solution you should check out.